I just love pasta in any form. I can have it any number of times and any time of the day. I love to have it with any sauce and combination of veggies. I usually fix a pasta lunch for myself when I am bored to make an elaborate meal. I made this pesto from Mahanandi when I had two bunches of basil and spinach. It can be had with any kind of pasta. I used Rivocca. Wash and dry the basil and spinach leaves. In a blender combine the basil, spinach, garlic, cheese and cashew nuts. Drizzle the olive oil in middle till you get the desired consistency. Blend in a food processor, till the nuts get ground well and the mixture gets thoroughly combined. If you need a thicker consistency, reduce the amount of oil. Top the pesto on any cooked pasta and enjoy! and also to Presto Pasta Nights hosted at Cooking Diva this week. Apple sauce is a puree made from peeled or unpeeled apples with the addition of flavorful spices like cinnamon. It is served as an accompaniment with main courses usually for breakfast like oatmeal, pancakes, muesli etc. and also in baking cookies and cakes. It is often used as food for babies because it does not require the use of teeth. It is sometimes recommended to combat diarrhoea, since it is high in pectin. It can be made into a smooth paste by blending. But I like it to be chunky. Peel the apples, core them and chop them roughly. In a saucepan add the water, cinamon sticks and chopped apples and bring to a rolling boil. Cover with lid and simmer for about 15 to 20 minutes until the apples get cooked well. Add the sugar and mix well.Simmer for 3 more minutes. Fish out the cinnamon sticks and transfer to blender.Blend to a smooth paste. You can also skip the blending step. Sending this to Eating with the seasons hosted at Maninas. This is a post I had in my archive for long. I prepared this bread in the summer when the mangoes were at its peak. This is a beautiful moist and chunky breadfilled with the goodness of juicy mangoes and golden raisins and flavored with spices. After browsing through a lot of recipes for bread with fruits I cam up with this recipe of my own.. It was too delectable and there were no leftover! Grind the flax seeds with 1/4 cup of water in a blender. In a pan whisk together the ground flax seeds and oil till well blended. In another vessel, take the flour, sugar, brown sugar, baking powder, baking soda, cinnamon, ground ginger, nutmeg and salt and mix them together without any lumps. Pour the liquid ingredients into the dry ingredients and mix well until all the ingredients are well incorporated to form a very thick batter. Stir in the mangoes and raisins. Butter and flour the loaf pan. Shake off excess flour. Pour in the batter into the loaf pan and level the top with a spatula. Bake the bread for about 60 to 70 minutes, until a fork inserted in the center comes out clean.Let the bread cool for about 5 minutes. Loosen the cake by running a knife along the sides of the pan. Transfer it to a wire rack and cool well. You can dust the top with icing sugar if you like. Store the leftovers in a wrapped plastic bag. Tastes best the next day because the spices get infused into the bread very well. It was the first time i tried making murukku. Though I did not get the perfect shape, I was quite satisfied with the results for the first time. I also made athirasams. I remember amma making these goodies especially during festivals and distributing it to our neighbours. Miss being at home especially during these festive seasons.. Mix the rice flour, urad dhall powder, hing, salt, sesame and cumin seeds along with the butter. Mix using fingers to obtain a bread crumb consistency. Add water little by little and knead to form a soft dough. Heat oil in a heavy bottomed pan. With the help of a 'murukku achu' make small circles and deep fry them in medium-low heat in batches for about a minute. Be careful they do not burn. Happy Diwali to all my dear friends!! Cabbage soup diet is something which many of us have heard of. I personally feel that it is sought of a crash diet, which might lack certain nutrients and making you feel weak over a period of time. But this cabbage soup definitely works wonders and helps if you need to shed few pounds immedietaly. It promises a 10 pound weight loss in one week. But this diet should not be carried out for more than a week.. I do not recommend this diet but I feel that this soup is healhty because it is packed with many vegetables..It is not a fancy kinda soup, but it is a basic recipe which can be altered to suit ones taste buds. I used a pressure cooker to make this soup.It can also be made in a crockpot or any large vessel. Chop the cabbage, onions, tomatoes, carrot, mushrooms, bell pepper and celery. Heat some oil and saute the garlic and onions for a while. Once they turn translucent, add the tomatoes. Once it gets cooked, add all the other vegetables. Saute for a while and add the chilli powder, cumin powder, salt and pepper. You can also add any soup mix if you like at this time. Add water so that it just covers all the vegetables. 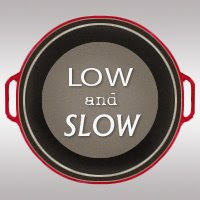 Close the pressure cooker and wait until you get one or two whistles. Switch off the heat. This goes off to Diet Foods event being hosted by me. I made these soft breadsticks from Min's blog. 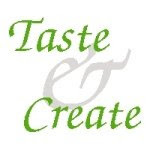 I was paired with Min for Taste and Create who is guest hosting the event for this month.Taste and Create is an event hosted by Nicole where each one gets a partner and cooks from your partner's blog. I found a lot of wonderful recipes for baking and cooking. These breadsticks tempted me a lot. I made these beauties immediately and we had it with pumpkin-zucchini soup. They turned out soft and chewy. I froze half of the batch. We also had a few of them just with some marinara sauce. It is a basic recipe and I made no changes to the original recipe. I just halved the recipe. Dissolve the yeast and sugar in lukewarm water.When it turns frothy in about 5 minutes, add the salt, melted butter and flour and mix well. Add more flour if necessary.Knead to form a smooth, elastic dough. Place in agreased bowl and cover with a tea towel. Punch down for every 10 minutes. Do this for atleast 5 to 6 times. With the help of a rolling pin, roll the dough into one inch thick. Cut into strips of required length with a knife or pizza cutter. Brush with melted butter. Top with garlic salt.You can also use parmesan cheese, parseley or any dry herbs for the topping.Place on a baking sheet and let it rise for about half an hour. Bake in a preheated oven at 350 degree F for about 15 minutes until lightly browned. Do not overbake it might turn hard. This is a smooth, creamy and flavorful soup perfect during fall when pumpkins are available in abundance. We had this for dinner along with breadsticks.It has spaghetti in it and is quite filling. Heat the oil in a saucepan and add the chopped garlic, ginger and onions.Cook till they turn translucent. Then add the chopped carrot, salt and pepper. Cook for about 3 minutes. Add the chopped tomato, chilli powder, cumin powder, sugar and dry herbs (oregano, basil, rosemary).Stir well unitl everything is combines. The herbs are optional.They can also be replaced by any other herbs of your choice.Cook for 3 more minutes. Add the bay leaf,chopped zucchini and vegetable stock/water. Bring the mixture to a boil. Cover the saucepan and allow it to simmer for about half an hour. Remove from heat and allow to cool.Fish out the bayleaf and blend all the ingredients together.Strin the soup if required. Bring back the strained liquid to the saucepan.Add the spaghetti to the soup and simmer for about 10 minutes or unitl the spaghetti gets tender and al dante. Garnish with fresh parsley and serve hot with breadsticks. And also to WTSIM # 20 for the love of gourds hosted at Cook Sister. I discovered that it was long since I baked something with yeast..I love the rising, kneading, shaping of the dough. Though it is a long process, it gives a sense of satisfaction when you prepare home-baked goodies at home..I made these potato buns one evening and they came out too good..These buns are similar to the piroshkis. But the dough is spiced up with some fresh cumin and chilli..They turned out too soft and delicious.. Mix the sugar in the lukewarm water.Add the yeast to it and leave it aside for about 7 to 8 minutes until it turns frothy. Take care the water is not too hot, cos it kills the yeast and also not too cold as yeast is not effective in cold water. Stir in the oil, salt, milk, flours, chilli powder and crushed cumin seeds. Knead well with hands to form an elastic dough.. Place in a greased vessel and cover it with a tea towel. Allow it to rise until it gets doubled in size.It takes around 50 to 60 minutes. Chop the potatoes finely. Meanwhile prepare the filling. Heat oil and fry the onions till it turns translucent. Add the turmeric, cumin, coriander and chilli powder. Cook for a minute. Now add the potatoes and salt and cover and cook for about 5 minutes. Allow the mixture to completely cool. Divide the dough into large lemon sized balls. It yields about 12 to 13 balls with the quantities mentioned above. Place the ball on a greased surface and roll it out slightly to about 3.5 inches in diameter with a rolling pin. Alternatively, you can also press the ball with your fingers to spread it out. Place a tablespoon of the potato mixture in the center andbring the edges of dough to the center to seal. Place seam side down on a baking sheet. Allow it to rise again for about an hour. Bake at 4oo degree F for about 2o minutes until the top gets slightly browned. This is my entry to World Bread Baking Day! This pizza uses the ever versatile tortilla as the crust..It can be made in a matter of few minutes when you have all the toppings..Inspired by a recipe from Food Network, I decided to makes this instant tortilla pizza. It tastes similar to a thin crust pizza. We had it as a snack! Stack the tortillas one over the other on a baking sheet and spread over the tomato sauce required..Also add the desired toppings..Sprinkle the required amount of cheese. Place on the top rack and bake for about 15 minutes until the cheese on top melts.Take care the tortilla doesnt burn.. Optional : You can sprinkle some cheese in between each tortilla so that they stick together and are held in place. Sending this to Food for 7 stages of life hosted by Radhika and Sudeshna. Ragi koozh or porridge is a drink made from finger millet flour..Millet (ragi) has many nutritional benefits..This is a popular drink in South India..It cools the body and a glass of this keeps you full for about 8 hours..I found a packet of finger millet flour in an Indian store and was immediately reminded of my grandma making this koozh often..I did not like it much as a child as it never tasted too good..However, my mom used to make a sweet version, which we loved.. Here comes the recipe for both versions..
Add water to the ragi flour and mix it with your fingers so that there are no lumps..Allow it to sit for a while for atleast an hour.This helps in the fermentation process.Fermentation helps in increasing its nutritional benefits several folds..It can also be left overnight.. In a saucepan, cook the ragi water mixture on medium-low heat for about 15 minutes until almost all the water evaporates and the ragi is well cooked. Keep stirring continuously without allowing lumps to form. It must have the consistency of a thick batter..
Switch off the heat and allow it to cool completely.. Mix in a pinch of salt and buttermilk and serve cool..Can be had by itself or with a pearl onion or curry of your choice.. The sweet version..After cooking the ragi, add milk and sugar or milk and jaggery..We loved this version.. Since this is a healthy and diet conscious food, this is my entry for Diet Foods being hosted in my blog.. 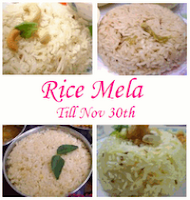 This rice is perfect for lunch boxes.It is a one pot meal and can be prepared in a jiffy.It has the aroma and flavor of fresh coriander leaves combined with spices.It tastes great with raita and chips. Wash and chop the coriander leaves.Also chop the onions,green chillies and tomato..
Wash and soak rice for atleast hal an hour. In a pan, add the ghee and once it becomes hot add the coriander leaves and green chillies.Saute for about 2 minutes until the raw smell disappears..Allow the mixture to cool completely. In a mixie grind the coriander-chilli mixture along with the ginger,garlic,coconut and a little water. In a pressure cooker/ kadai / cooking vessel,heat a little oil. Add all the spices and fry for a minute until you get the aroma of the spices. Take care they do not burn. Add the chopped onions.Once they turn translucent, add the ground masala. Saute for about two minutes.Add the chopped tomatoes.Allow it to cook well.Then add the soaked rice and saute again.Add the required amount of water(about 4 cups).Add salt to taste. Cook till the rice absorbs all the water.Fluff with a fork to seperate the rice grains. Serve hot with raita and chips! Sending this to Dee's Herb Mania: Coriander hosted this month by dear Siri.. This is a classical Indian dish made with eggplant and a mild blend of spices..This dish is made in several ways.I got this recipe from Swati's blog..It tasted too good with chapathis.It also goes along well with rice,rotis and naan.. Grease the brinjals and broil them in an oven until the skin browns and the inner flesh gets cooked.Alternatively, grease the brinjals with oil and hold it directly over the burner.Keep rotationg the brinjal with the help of tongs..This takes a while for the brinjals to cook well. Cool completely and peel the brinjals.Chop the brinjal into small pieces or mash them roughly with your hands. In a skillet, heat some oil and add the cumin seeds.Once they splutter add the slit green chillies and onions and cook till the onions turn tranlucent.Add all the powder and cook for two minutes..
Then add the chopped tomatoes and cook till it turns mushy and the oil comes out on the sides.This takes about 3 to 4 minutes.Finally add the chopped brinjal.Cover and cook for about two minutes..Simmer for 3 minutes..
Everyone knows the benefit of eating dates..The very low calorie count and the huge amount of healthy substances in dates make them the best nutrition for a diet plan menu.It provides the daily necessity of iron..These dates biscuits are crunchy and sweetened with dates..I got this recipe from DK's blog and am glad I made it..The recipe is simple and makes a perfect and healthy snack in just under 30 minutes..
Sift together the flour, salt and baking powder.Rub in the butter until it resembles bread crumbs. Stir in the sugar and chopped dates and mix well..
Add the milk to the flour mixture and mix well to form a dough. On a lightly floured surface knead to form a dough. With a rolling pin knead the dough to about 3/4 th inch thickness. Cut into circles or to the required shape.Gather all the remaining dough.Roll out again and cut into circles/required shape.Do this with all the dough. Transfer them to a baking sheet with about 1/2 inch gap between each..
Glaze with melted butter and bake for about 10 minutes until the biscuits have risen and turned golden brown. Cool in a wire rack..